Home / General / Are you content with who you are and what you have? Are you content with who you are and what you have? A butterfly can’t be of the same size as a bird no matter how much it eats. A butterfly can’t look like a bird regardless of how well it is made up. Uncomfortable truth is, many of us can’t be the butterflies that we truly are. We want to be birds… and not just any bird but ones that can soar! We want to keep up with trends regardless of what it may cost us. We want to be in vogue even when our pockets are out of vogue. We want to create that all-perfect picture of ourselves for the world to see even if it drains life out of us in our closets. Of what essence is life when we endure needless depression in a bid to create a needless impression? When the applause and ‘kind’ words fade out, what happens to the rot we have craftily covered with lies and deceit? What is life when all you do all day is to impress everyone except your own self? A butterfly that forces itself to be a bird always forgets that birds have stronger wings. They have feathers to keep them warm. They are well-equipped with natural features to surmount any danger. 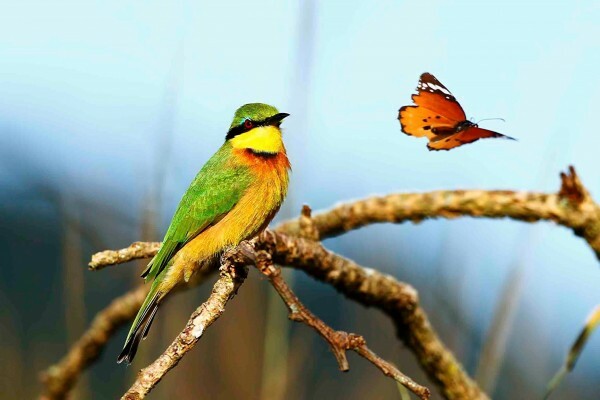 In other words, when a butterfly exposes itself to the dangers a bird faces on a usual day, it sets itself up for premature destruction. Don’t destroy yourself yet. Don’t drown in debt in the name of class. Don’t mess up your future just because all you are concerned about is how others perceive you today! Keeping up with appearances is even worse in today’s world. Thanks to social media. Many young (and obviously old) people are in haste to show off what they don’t have. They are in a hurry to flaunt who they are not. Though it costs every tissue of their being, they just don’t mind! All they have in mind is others… and never themselves. All they are concerned about is how to be accepted by society for who they are not. Who cares if you fed five thousand men at your wedding with a loan? Who cares if that plush house you just rented (not even bought) was done so at the expense of something more needful? Who cares if your new hair is of the same worth as a mansion when you can’t even afford a daily balanced diet!? Who cares when you are depressed? Before you think of impressing others, think about yourself first. After all, your life is yours. Perception others have about us doesn’t pay bills. A lifestyle run on the wheels of deceit soon grinds to a frustrating halt because it can’t be sustained. It’s like trying to start a project you know very well you can’t finish. Sooner or later, when it comes to a standstill, the truth will be embarrassingly laid bare. Just be yourself no matter how hard it may seem to be. Be content with who you are and what you have regardless of how little. Contentment is great gain. It’s better to live in your penury than to feign luxury. It’s safer for others to know you for who you really are than for them to know you for who you really are not. You have your own life to live. Don’t go borrow someone else’s. When you live a borrowed life, you fight unnecessary battles. When the life you are living is not yours, you bear needless frustrations because of others’ needless expectations. You pay needless debts and make needless friends. You have needless headache over things that should not even matter to you. After all, you live a life that is not yours! A borrowed life is like a fairy tale. It seems all blossomy until reality sets in. Keeping up appearances is like having a night of sweet dreams. Just when you thought it was about to get sweeter, you need to wake up to realities. Just when you thought you had deceived everyone else with that flashy lifestyle, you need to wake up to the truth that you have ‘earned’ diseases in trying to keep up to standards so-called. Just when you thought that you had ‘branded’ yourself so well as a filthy rich ‘boss chick’ on social media, you need to wake up to the reality that the slum you are squatting in is about to be closed own. Just when you thought you had impressed your ‘enemies and haters’ with that high-budget wedding, you need to wake up to the reality that your money lenders and service providers will be at your heels soon. If it doesn’t cost a dime to be the butterfly that you are, why would you expensively want to be a bird? To be yourself is cheap. To be others? Really expensive.